The Smart Baler – Have a Smartphone? You’re already an Expert. If you can use your smartphone, you’re already an expert at using our Smart Baler interface. The soon to be launched PTR Smart Baler features innovative technology that will revolutionize your company’s waste and recycling systems. It was carefully designed to increase speed, accuracy and efficiency. We knew that it was critical to make the interface user-friendly. The all-new ‘Smart Control Panel’ is a touchscreen that will feel immediately familiar to users. That’s because it’s set up very similarly to the screen of most smartphones. So, if you can use your smartphone, using this touchscreen will be a breeze. The PTR Smart Baler also features keyless operation. Eliminating keys increases efficiency, because you’ll never find yourself searching for a lost or misplaced key again. Purchasing a new key is costly and results in unwanted downtime. Instead, you’ll input a PIN number to use the baler. Selected employees can be assigned their own, personal PIN number, as well. There is even an option for a fingerprint reader – just like your cell phone. The weight readings provided are the most precise possible, and the data attained is the most accurate to date. You can use this highly accurate information to make better decisions- decisions that will ultimately save your organization valuable time and money. We’ve barely scratched the surface of what The Smart Baler has to offer. The new features will increase safety, productivity and overall efficiency, while helping your company reach and exceed it’s sustainability goals. Ready to learn more? 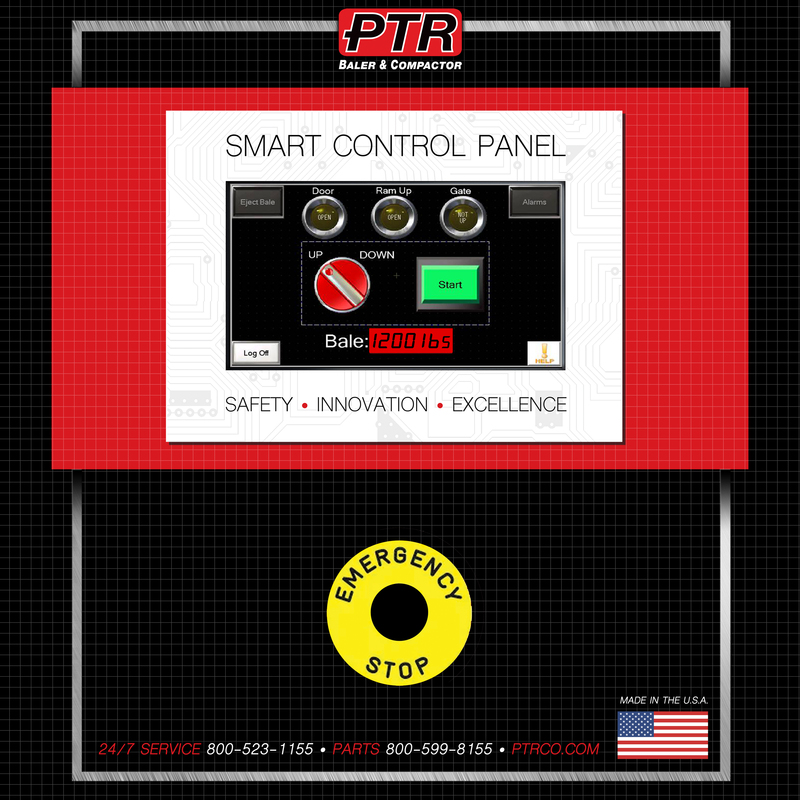 Contact PTR today.